A field manager used for laying out Dialog and Status screens. This manager handles an icon, a message, and a special area which can hold a list of user-specified custom fields. To manage the list of fields in its user area, this manager employs a simple vertical field manager. This manager lays out its icon in the top left corner, and its message label in the top left corner. The rich text field object containing the message label specifies the formatting and alignment of the label. This manager lays out the subordinate field manager controlling the user field area below its icon and label. 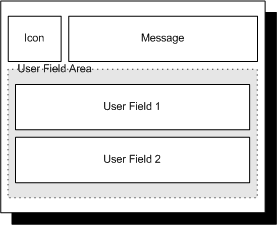 The task of laying out the user fields is delegated to the subordinate field manager. Constructs a dialog field manager. Constructs a dialog field manager with provided style. Adds a user field to this manager. Deletes a user field from this manager. Deletes all user fields from this manager. Retrieves one of this manager's user fields. Retrieves the manager for this manager's user field area. Inserts a user field to this manager. Invoked by the framework to move focus within this manager. Adds or removes this manager's icon. Lays out this manager's contents. Use this method to build a dialog field manager with no scrolling style. Use this method to build a dialog field manager with the specified scrolling style. style - Scrolling style for this manager (can be Manager.VERTICAL_SCROLL or Manager.VERTICAL_SCROLLBAR). messageStyle - Scrolling style for this manager used for the message portion (can be Manager.VERTICAL_SCROLL or Manager.VERTICAL_SCROLLBAR). f - Field to add to this manager. field - Field to delete from this manager. index - Position of field within this manager's user field list. This dialog field manager uses another manager to control its user field area; use this method to retrieve that manager. Manager for this manager's user field area. icon - Icon to add, or null to remove this manager's icon. label - Formatted string to use as this manager's title. This system invokes this method to prompt this manager to lay out its contents. Note that dialog field manager will in turn prompt its user field manager to layout any extra fields in its user field area. width - Horizontal space available to this manager. height - Vertical space available to this manager.